“Show me how to love them”. “Give me a vision of what you want this day to be and give me the strength to fulfill it”. “Open my eyes to those who are hurting and give me the words to lift them up”. You find what you seek, so don’t let others choose for you or allow the circumstances to choose for you. You choose what you seek. What doors are you knocking on? 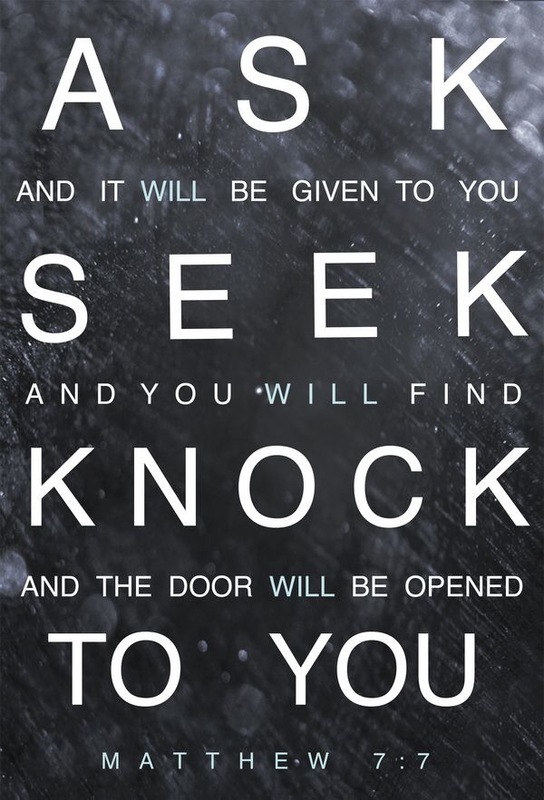 Ask, seek and knock on purpose and it will open up the life of purpose you have been looking for. Is this Cindy? MY Cindy? This is Tanja (Donnelley) Prosock. Do you remember me? Angela introduced me to your blog “Just a minute” and I LOVE IT! I devour it! I look for it. I read it with my devotions when I get to work. It makes me think and cry and gives me hope. I want to sit in your kitchen with a cup of coffee and catch up and pray together and ask you questions about your life. I can see you saying these exact words in person as I read them. Words that you poured in my life (many) years ago at Masters and now you are doing again. You are truly a blessing to me. I miss you. Thank you for writing these. They are reaching me out here in PA and still blessing me where I am in life. Let me know this is really you. Of course I remember you! And have many fond memories of the time we got to spend together so many years ago. What an absolute delight and gift it is for me to know that I still get to sit across from you and pour words of life in you! Thank you for letting me know!!! I will be praying for you and your hubby and am so very thankful for this but of technology that allows us to connect. Hugs and love to you pretty girl and have a wonderful Christmas!